Learn more about our All Natural Products. In a blender, purée all cilantro lime sauce ingredients together. Refrigerate until ready to use. Remove core from head of lettuce; wash and dry leaves. 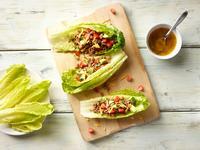 Arrange lettuce leaves on the outer rim of a serving plate. Spoon turkey onto the center of each lettuce leaf and top with avocado, tomato, cheese and cilantro.